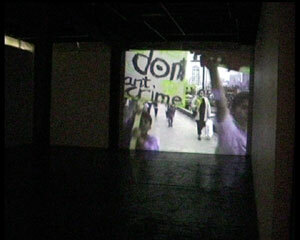 NO MORE ICE CREAM is a project in three stages; a workshop, a demonstration and a video installation. 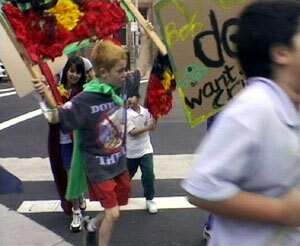 Video footage was presented at Artspace, Sydney, documenting a local children's demonstration which occurred on Thursday 20th September 2001 in the Sydney neighbourhood of Woolloomooloo. Woolloomooloo is an area undergoing regeneration and displacement of local aboriginal inhabitants. The demonstration, which addressed a myriad of issues, passed through local streets, the Navy base and the recently redeveloped Finger Wharf. 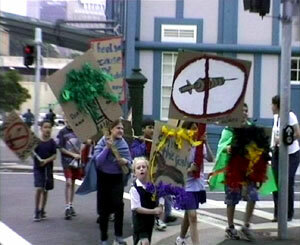 This event was instigated and workshopped by Treister and Iwanczak with children aged 6-9 from the Juanita Nielson Recreation centre in Woolloomooloo and can be seen as an inquiry into the political e/affectiveness of action for social change and political justice. Finely balanced between fiction and reality this piece also challenges representations of related local and international events in the media, whilst also allowing the children to express their environmental concerns and develop a sense of their own voice and power within society. 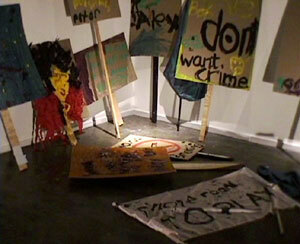 Banners and flags made by the children were presented in the gallery alongside the video footage. AN' NOBODY WANTS / TO GO TO JAIL! NOBODY WANTS / TO GO TO JAIL! ARE YOU TAKING OVER / OR ARE YOU TAKING ORDERS? ARE YOU GOING BACKWARDS / OR ARE YOU GOING FORWARDS? "The best lack all conviction/while the worst are full of passionate intensity." We have all heard and understand the phrase 'a children's crusade', although when you think a little more about it is not easy to attach a single unitary meaning to it. A web search on the phrase brings up everything from a church youth initiative to social action to ensure childrenÕs education in the inner city. It does seem to speak of innocent unspoiled expression coming deep from the heart. Certainly in overtly Christian contexts the innocence is seen as paramount, giving some sort of visionary quality - bunches of smiling uncorrupted kiddies wreathed in light travelling towards some salvation that their youth - and lack of exposure to the ways of the world - guarantees - as opposed to the rather rockier path that the more hardened occluded sinner is meant to travel. Within the rhetorics of religiosity this loading is maybe because the youthful soul is seen as having 'only just arrived' in this world, therefore less sullied by sin, and closer to its ideal state. When it comes to the historical event(s) that gave rise to the phrase things are murkier and darker. Between 1200 and 1212 there were marches lead by two youths - one Stephen of Cloyes in France and another Anthony in Germany. Independently they set across Europe with bands of people who may have been youth, or may have been composed of the lower orders and therefore seen to be like children, legend has it up to 20,000 in number. Thousands starved of hunger or died of cold in the Alps, and those who survived to commission ships to take them to the 'Holy Land' were sold into prostitution and slavery by the captains that they had hired. Despite this being a vicious debacle, Catholic sources talk of this event as returning to the 'purity' of the crusader ideal- one can only believe because they are dazzled by the reputed youth of the participants. Whatever the truth, these events became legend and culturally entrenched. Generally we privilege the idea of youth with possessing insights and agendas that are more deeply felt and better somehow than those that have compromised by time and life. The 'idealism of youth' is referred to in a way that is a combination of admiration, nostalgia and distain. Similar approaches and attitudes have become entrenched, mythologised, and commodified by popular culture - from flower children dreamily placing blooms in the gun barrels of soldiers (who are working for 'The Man' ) to the high-spirited gang in Scooby Dooby Doo always uncovering the dastardly plots of dishonest grown ups, to soft focus shots of Shirley Temple type kids asking lispily 'why adults can't just bury their differences and live together?' in a thousand domestic break up movies. Out of the mouths of babes etcetera... echoing the innocence that we are meant to have possessed before the Adamantine Fall. Our culture has come to privilege the unmediated response over the mediated and to glamorise the spontaneous gesture as being of a transcendental order of 'realness' and therefore of a great value. Look at the comparison of the inactive (and by implication effete) 'schooled' white to the direct action taken by black people in the lyrics to the Clash's 'White Riot'. Somewhere in the unconscious racial stereotyping of the song we can locate the ghost of Rousseau walking with the noble savage, closer to the ways of nature and therefore to 'natural law' before the will was sapped and the moral view occluded by the lies of civilisation. Generally in the stories and rhetorics of the Left and the Right the 'spontaneous' uprising of the oppressed proletarian or the honest Aryan is fetishised and memorialised, and a great deal of energy and effort invested in making political actions - riots, uprisings, whatever -seem as unstoppable expressions of energy and emotion - as 'natural' events rather than social or constructed ones. In this scenario this 'Realness' and emotional truth are constructed to give the act a weight and an essential autonomy against the artificial hypocrisies and engines of oppression. The moral and the truthful are located somewhere in nature rather than in culture. Slowly and inevitably we drift to the position where any deracinated gesture of 'opposition' becomes privileged without any consideration of its usefulness or value in actual or political terms being taken into account. In the contexts of the 'art world' the work that is seen as political (no matter how idiotic and feeble) is seen to be removed from the epicine and complicit bourgeois codings of the art world or indeed from any of the criteria that would normally be used to determine whether something was any 'good' or not. It is 'Real'. To say that a work which expresses itself as being against exploitation is terrible is to identify yourself as being with the forces of oppression. Conversely it is a given that any work that claims to be in 'opposition' is de facto 'good'. This generous if simple minded equation has encouraged unfortunate outcomes. As if in perverse recognition of the way that we value ideas of the innocent and the spontaneous as means of legitimisation for actions, a great deal of time and effort has in turn been spent in describing political actions as being constructed. Marches are described by the authorities (or the opposition) as being 'orchestrated' by shadowy others who are taking advantage of innocent participants and real grievances to their own dark and nefarious ends, events are 'infiltrated'. There is an enemy within, people who are responsible for the action becoming 'bad' protest rather than 'good' protest... If something has become mediated it has, it seems, lost its essential virtue. 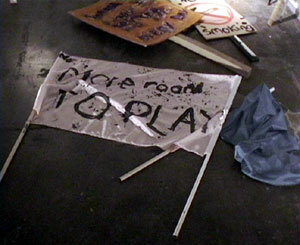 In these common political constructions and exchanges around the ideas of childhood, youth and innocence, curiously what doesn't get a look in are the activities of 'the playful' The act that is seen as 'playful' or anarchic or mischievous is suspect as it is both dangerously solipsistic and dangerously fluid. Within the gestural vocabularies of political action it has come to be seen as anathema - as 'play' threatens the orderings of the real and is in a state of permanent shift. This mutates into the area of social event and language described by Bakhtin as The Carnivalesque: which has as its function to uncover, undermine - even destroy, the hegemony of any ideology that seeks to have the final say about the world. 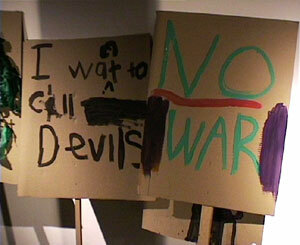 The video tape of child protesters makes us question the way we read and load this event and other similar events. The staging of the march and the promiscuous and generous spread of issues and manifestos embraced by the marchers (drugs, smoking, housing, ice cream) serves to atomise our readings and our certainties. It starts to subvert the idea of subversion itself, opening up a hall of mirrors and ushering the event into a context where images and actions are reflected into infinity, become manifold and various, removed from easy narrations or simple causality.